As this month continues, we begin to approach some very exciting dates! February is host to two of our favorite holidays; Valentine’s Day and National Margarita Day! In honor, we would like to give you all a little lesson on one of our best subjects…tequila! With a little extra knowledge, you can only imagine how much more you will enjoy your favorite tequila or margarita! Blanco, Reposado, Anejo – You have all heard these words before, but may have not known exactly what they mean. We’re here to break it down! Blanco, Reposado and Anejo are three of the various types of tequilas. What they stand for is the type of aging process that the tequila has been through. Similar to other alcohols, such as wine, the length of aging makes all the difference in the taste and flavor of this spirit. Now, with Valentine’s Day right around the corner, here is a recipe that is sure to sweeten up your holiday! 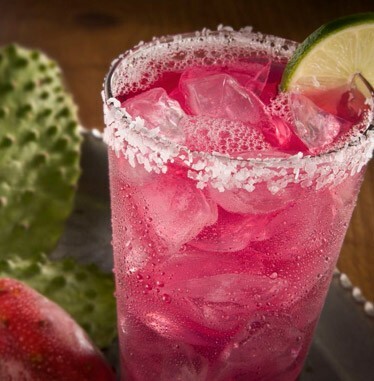 Our Prickly Pear Margarita is one of our February Margs of the Month, on special for only $8.29! This margarita features Cazadores Reposado Tequila, providing a delicious taste with hints of cinnamon, lemon, fig and spice. It only requires a few ingredients, so this is definitely an easy drink to mix up at home! ALSO! Join us for National Margarita Day on Saturday, February 22nd! We will be celebrating with $2 Margaritas all day long! Join our VIP E-Club or Like us on Facebook to receive this offer!